In an announcement that could change the political mosaic of the country, Chief Minister and TRS president K Chandrashekhar Rao on Sunday declared he would not hesitate to set up a national party after the Lok Sabha elections. “If the need arises, I will set up a national party. The country needs to be unshackled from the misrule of both BJP and Congress, and I will fight for this goal till the last drop of my blood,” he said. 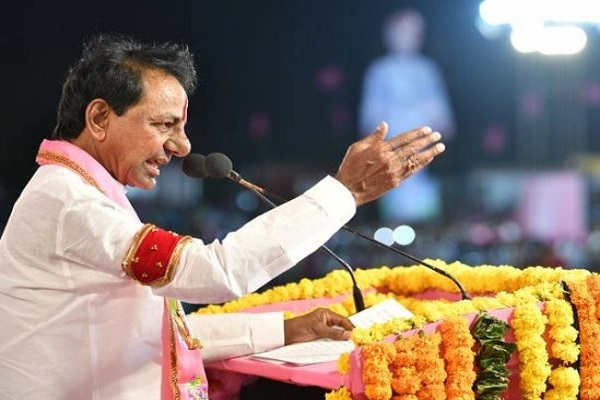 Launching the TRS election campaign here, Chandrashekhar Rao set the tone for the Lok Sabha polls slamming BJP and Congress, stating that they did precious little to harness the potential the country holds on various fronts, including water and power management. “What we need is a BJP and Congress mukt Bharat,” he declared, adding: “It is time to put an end to the tu kitha, mai kitha politics that have plagued this country for the last seven decades”. In a hard-hitting speech, Chandrashekhar Rao, while focusing on the role TRS was set to play at the national level, also took aim at Andhra Pradesh Chief Minister N Chandrababu Naidu, exploitation of religion by BJP, Telangana’s rapid pace of development that made the State into a role model and how it was only the State government that pitched a national perspective before the 15th Finance Commission instead of groveling before it asking for funds just for the State. “It is shameful even to mention this, but we need to talk about it. We have to have a conversation about Prime Minister Narendra Modi and the wannabe Prime Minister Rahul Gandhi. Every day, Rahul keeps saying PM chor hai. PM chowkidar nahin hai, yeh chor hai. In response, Modi says the mother and son (Sonia and Rahul Gandhi) are thieves who are out on bail. Are these people Prime Minister material? How does the world see us when such is the running commentary,” Chandrasehkhar Rao said. The Centre, he said, also failed in tackling issues with Pakistan and other matters of international importance. He said the two so-called national parties never cared for the country or its people. “Now, it is the time for somebody to take up that responsibility to transform the country, and give people what they deserve with respect to a better life and amenities,” he said. “If no one takes up this cause, this country will continue to languish in the mire that Congress and BJP pushed it into,” he said. Answering the nowadays oft-repeated question by detractors as to what TRS hopes to achieve with just 16 MPs in Parliament, Chandrashekhar Rao said he was not idle for the past one year and made plans with other regional parties to put together a coalition of 150 to 160 MPs. “We will do this and rid this country of the terrible leadership that plagued it so far. Telangana has to play a big role in national politics,” he said. The country, he said, was in need of comprehensive administrative and judicial reforms, which will be possible only under a government run by the Federal Front. “For instance, there is just one Supreme Court for such a large country. Is this the right policy? These are questions that need to be looked into and answered,” he said. The TRS president said it was saddening to see India, with an installed capacity to generate 2,21,000 megawatts of power, recording the highest ever use at just 1,80,000 megawatts. “Half the country is languishing in darkness. Similarly, India is blessed with 70,000 tmc of water and even if every inch of 40 crore acres of agricultural land is irrigated, it will still leave us with a surplus of 30,000 tmc,” he said. “I asked Modi why it is taking decades for the Brijesh Kumar Tribunal to decide on the Krishna river water sharing. It was set up in 2004. It is now 2019, but still no decisions are made yet on a subject that should not have taken more than a few months,” he said. Chandrashekhar Rao recalled that he spared no words when he discussed this with Modi. “I asked him what happened to my Tribunal. He said bhaissab, the moment we said Cauvery, Tamil Nadu was on fire. I told him that he was clueless that the country had 70,000 tmc of water and he was of no use if he was incapable of ensuring sharing of river water between States,” he said. Chandrashekhar Rao called on the people to bless his endeavour to change the face of the nation and support TRS in the coming elections. He also called for the need to Centre to step back on subjects that can be handled better by the States. “Who needs PM’s Gramin Sadak Yojana? Why should the PM be laying roads? Are there not people at local level who can do that?” he asked.